YOUNG has earned its reputation as a journal at the forefront of the field of youth studies. Truly international, the journal is devoted to advancing thinking about contemporary youth and the issues that impact on young people’s lives. Its interdisciplinary nature ensures that it features articles that advance thinking about youth studies, challenge orthodoxies and open up understanding of diverse young lives. YOUNG is available electronically on SAGE Journals Online at http://journals.sagepub.com/home/YOU. YOUNG is an international scholarly journal of youth research, which seeks to publish innovative and outstanding theoretical, textual, and empirical research on the life situation of young people. The journal has an interdisciplinary profile and welcomes original articles that integrate perspectives from different approaches and research traditions. The aim of YOUNG is to bring young people’s experiences to the centre of analysis with a view to strengthening and promoting multidisciplinary, contemporary and historical youth research with an international perspective. The journal is a forum for critical discussion and encourages submission of papers from all countries and contexts. YOUNG was established in 1993 and is financially supported by the Nordic Council. YOUNG welcomes manuscripts between 5000 and 8000 words and all submissions are subject to peer review through a double-blind reviewing process. We invite youth researchers to contribute scientific articles and book reviews. Submission of original articles is open to all active youth researchers working in the social sciences and related areas. We may occasionally publish articles that have been previously published in other languages. In such cases, the articles go through the standard review process, and are required to be reworked. All manuscripts are reviewed initially by the Editors. Those papers that meet the editorial standards of the journal and fit within its aims and scope will be submitted for peer review through a double-blind reviewing process. Authors submitting manuscripts can have only one submission in process at any one time (as sole or first author). To meet the criteria of YOUNG, the manuscript is required to have relevance for youth research field and engage in youth research literature. The manuscripts are expected to present a clear argument and have originality and value for the scientific discussion. Empirical contributions are expected to be methodologically rigorous. 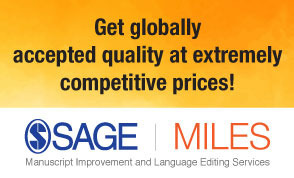 Manuscripts are submitted online via the YOUNG SAGE Trackwebsite at http://mc.manuscriptcentral.com/young. Title page with full title and subtitle (if any). Provide the names, affiliation and full contact details for each author, plus a short biographical note (50–100 words). Make sure that the manuscript is fully anonymized throughout the text. Main text and word count – suggested target is 5000–8000 words for articles including abstract and references, and 1000 words for book reviews. Text should be clearly organized, with only two levels of headings (no letters or numbers in the headings), and quotations exceeding 40 words intended. End notes should be kept to a minimum and should be signaled by superscript numbers in the main text and listed at the end of the text, before the references. Africa. London/New York: Zed Books. Africa (A. Sharma, Ed.). London/New York: Zed Books. Reclaiming the nation (pp. 67–78). London and New York: Pluto Press. Washington Post, pp. A1, A4. Haney, C., & Wiener, R. L. (Eds). (2004). Capital punishment in the United States [Special Issue]. Psychology, Public Policy, and Law, 10(4), 1−17. Haney, C., & Wiener, R. L. (Eds). (2004). Capital punishment in the United States. Psychology, Public Policy, and Law, 10(Special Issue), 1−17. Amin, S. (1976). Unequal development (Working Paper/Report No. E-212). London and New York: Monthly Review Press. Darby, A. (2002, August 20). Rarest tiger skin a rugged survivor. Sydney Morning Herald. Retrieved from http://www.smh.com.au on 26 April 2002. Tables: Tables should be typed on separate sheets and their position indicated by a note in the text. All tables should have short descriptive captions with footnotes and their source(s) typed below the tables. Illustrations:All line diagrams and photographs are termed 'Figures' and should be referred to as such in the manuscript. They should be numbered consecutively. Line diagrams should be presented in a form suitable for immediate reproduction (i.e. not requiring redrawing). They should be reproducible to a final printed text area of 190 mm x 120 mm. Images should be supplied as TIFF or JPEG files at high resolution. All figures should have short descriptive captions typed on a separate sheet. Authors are responsible for obtaining permissions from copyright holders for reproducing any illustrations, tables, figures or lengthy quotations previously published elsewhere. Permission letters must be supplied to SAGE Publications. Style:Use a clear readable style, avoiding jargon and acronyms. If technical terms or acronyms must be included, define them when first used. Use non-racist, non-sexist language and plurals rather than he/she. Use as few italics as possible. Do not italicize foreign words or repeated foreign vocabulary. Spellings: UK or US spellings may be used with '-ize' spellings as given in the Oxford English Dictionary (e.g. organize, recognize). Punctuation:Use single quotation marks with double quotes inside single quotes. Present dates in the form 1 May 1998. Do not use points in abbreviations, contractions or acronyms (e.g. AD, USA, Dr, PhD). Copyright:Before publication authors are requested to assign copyright to SAGE Publications and YOUNG Editorial Group, subject to retaining their right to reuse the material in other publications written or edited by themselves and due to be published preferably at least one year after initial publication in the Journal. Reviews:YOUNG includes a section in which books and other significant contributions to the field are reviewed. This includes both essay length and shorter contributions. Suggested target is up to 1000 words for book reviews. Books for review and manuscripts of book reviews should be sent to Malin Fransberg, School of Social Sciences and Humanities Linna 5031, FI-33014 University of Tampere [email: malin.fransberg@uta.fi]. Calls for special issues are always open for all researchers wishing to contribute. Contributions that theoretically and empirically address change and the emergent policies and practice that have an impact upon young people’s lives. YOUNG will assign 1–3 YOUNG editors to the special issue who will work on the issue with the guest editors. Guest editors are encouraged to write an introductory editorial for their special issue of no more than 3,000 words. The editorial will be reviewed by one or two YOUNG editors. Guest editors cannot publish their own work in the special issue. Special issues will contain a maximum of 5 articles. Both YOUNG editors and guest editors are responsible for decisions on inclusion of manuscripts in the special issue. However, YOUNG editors make the final choice on articles and the order of the articles in the special issue. A potential surplus of articles passing the review process will be offered publication in regular issues of YOUNG. Authors should submit full papers, not work in progress or abstracts. However, the author(s) can contact editors to discuss the relevance of the planned article prior to submission. Authors should clearly state that they wish to publish in the special issue. Submissions must follow the journal guidelines and be submitted for review via the YOUNG SAGETrack website at http://mc.manuscriptcentral.com/young. This means that all manuscripts are reviewed initially by YOUNG editors and the special issue guest editors. Those special issue papers that meet the editorial standards of the journal and fit within the aims and scope of the journal and of the special issue will be submitted for peer review through a double-blind reviewing process. Reviewers are selected by both guest editors and YOUNG editors. The names of persons who have accepted to review will only be known by the internal editors, however, in order not to break with YOUNG’s policy of anonymity of reviewers. Special issues are normally published around a year from the date on which call for papers is published. However, publication time of the special issue also depends on the smoothness of the review process and on the journal’s pipeline of other articles and other special issues. YOUNG publishes a maximum of two special issues per year, and never two after each other.